Field Wireless | Yokogawa United Kingdom Ltd.
Not being tied to wired communication loop, a Yokogawa wireless system can provide process measurements that were previously too difficult or uneconomical to implement. Yokogawa offers a complete line of ISA100 compliant pressure transmitters. The line includes transmitters that can measure differential pressure, absolute pressure, and gauge pressure. 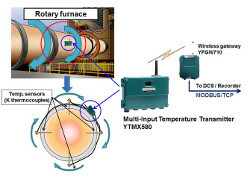 Yokogawa offers the dual-input YTA510 and the multi-point YMTX580 temperature transmitters. Field Wireless Multi-Protocol Module with “Field Wireless Communication Module FN110” acquires sensor data from a connected sensor and transmits it to a field wireless network through FN110. Yokogawa offers an IoT Enabled ISA100 compliant Gateway, a Access Point, a Media Converter, and a Management Station. All to help design a network to meet your needs. 2018.03.06 A brochure of ”Gateway Module”（FN110-R1/LN90）is published. 2017.07.18 A brochure of "Yokogawa Field Wirless Solution" has been updated. 2016.08.08 ISA100 Wireless End User Conference will be held on September 27th, 2016 in Rotterdam, The Netherlands. 2016.07.21 Murata started mass production of 2.4GHz-band wireless communication module which has been certified to be ISA100 Wireless compliant. 2016.06.17 FN310 and FN510 (ATEX Certification) has been released. 2016.04.22 FN110, FN310 and FN510 (Factory Mutual "United States and Canada" Approvals and IECEx Certification) has been released. 2016.03.18 YFGW510 Field Wireless Access Point (ATEX and IECEx Flameproof Approval Options) has been released. 2016.01.05 New bulletin "Yokogawa Field Wireless Solution"(Bulletin 01W01A13-01EN) has been issued. 2015.11.04 Pharmaceutical solution "Ground Well Level Monitoring" has been added. 2015.10.13 Murata has launched the engineering sample of ISA100 Wireless Module onto the market. 2015.07.28 Two application notes "Temperature Monitoring on PID loop at Steel Process" and “Tubeless tyres performance testing” are added. 2015.07.03 Plant Resource Manager (PRM) R3.20 has been released. It includes an improved management function for ISA100 Wireless™ field devices. Yokogawa Electric Corporation announces the introduction of a new “Wireless Anywhere” business concept on the plant-wide use of ISA100.11a compliant wireless communication technologies for both monitoring and control applications. For continuous processes that need sophisticated wireless control technologies, Yokogawa released the world’s first ISA100.11a compliant system devices and transmitters in July 2010, giving customers an expanded range of device choices. Based on the “Grow” concept, in 2012 Yokogawa released three new field wireless system devices and enhanced existing wireless pressure and temperature transmitters to enable its customers to expand their plant wireless networks and make full use of existing assets. 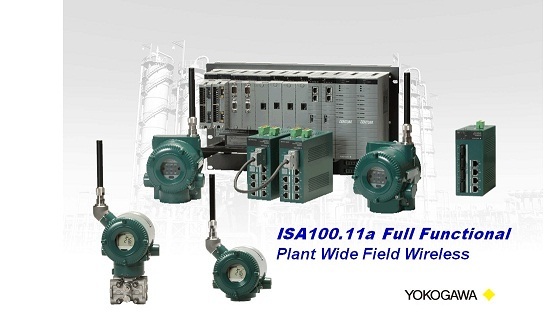 These ISA100.11a compliant wireless products can be used to construct highly reliable large-scale plant networks, and may also be incorporated with other Yokogawa products in small- and medium-sized networks, substantially expanding their capabilities. The ISA100.11a standard ensures high reliability, application flexibility, network expandability, and compatibility with a variety of wired communication standards such as FOUNDATIONTM fieldbus, HART®, and PROFIBUS. “ISA100.11a full functional” field wireless network systems and devices make use of state-of-the-art dual redundant technologies that enable a much higher level of reliability, and allow massive scalability and long-range communications. Yokogawa will aggressively promote this new “Wireless Anywhere” concept to widen the use of ISA100.11a-compliant products and related services. This augments our existing “Grow” concept, which encourages the introduction of wireless communication technologies by making a case for their inherent reliability, flexibility, and openness. Such systems ensure responses in real time by making use of state-of-the-art dual redundant technologies and can be quite large in scale, supporting connections to up to 20 access points and 500 field wireless devices. The data update time is 5 seconds when the system consists of a host system and 500 field wireless devices, and 1 second with a host system and 200 field wireless devices. The field wireless devices are proven to be able to communicate over distances up to 10 km*1, 20 times the range of conventional systems. Our wireless physical layer (Reliable Radio) and system redundancy technologies ensure a high level of reliability. With our Duocast technology, each field device simultaneously sends the same data to two designated access points, ensuring uninterrupted communication in the event that one of the points experiences a problem. The duplication of gateways and systems further strengthens the reliability of our wireless systems. The field wireless devices are proven to be able to communicate over distances up to 10 km*1, 20 times the range of conventional systems. *1 With a high-gain antenna. Local regulations may restrict the use of such antennas with field wireless devices. Yokogawa will develop modularized wireless components that incorporate the various technologies in its field wireless devices. This will make it easier for vendors to implement the ISA100.11a technology in new sensor products, and accelerate time to market. By the end of 2013 Yokogawa plans to begin releasing new field wireless devices with these components and expanding product lineup. Yokogawa will work with other members of the ISA100 Wireless Compliance Institute (ISA100WCI) to increase the number of WCI member companies and promote acceptance of the ISA100.11a standard, thereby expanding the field wireless market. To make a wider range of ISA100.11a-compliant products available to the market, Yokogawa may supply modularized components to other vendors. 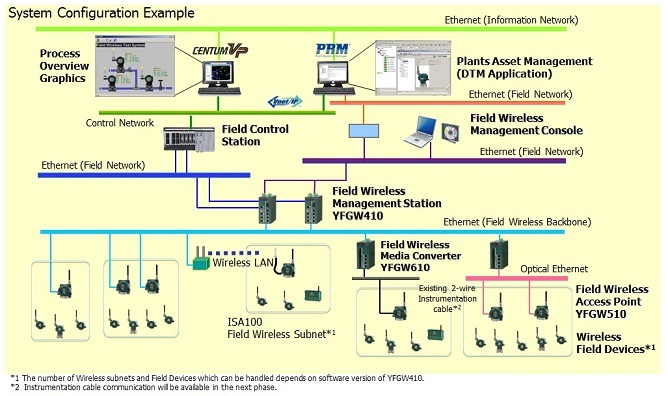 To encourage the use of field wireless systems in both monitoring and control applications, Yokogawa will seek to improve the effectiveness of plant-wide field digital networks by making it possible for wired and wireless field devices and systems to connect with host monitoring and control systems. This will necessitate the development of technologies that will ensure host systems and field devices can communicate with each other using a variety of protocols. For example, an ISA100.11a-compliant adapter would enable a wired field device to link up with a wireless network. Yokogawa is advocating the new Wireless Anywhere concept for solutions that work seamlessly with the diverse devices and advanced information technologies used at production sites. Yokogawa will continue to develop field wireless devices for both monitoring and control applications, and will partner with its customers to assure their long-term growth through the achievement of ideal plant operations. Yokogawa launched the world’s first wireless field products conforming to the ISA100.11a standard in 2010 and has led the business ever since. 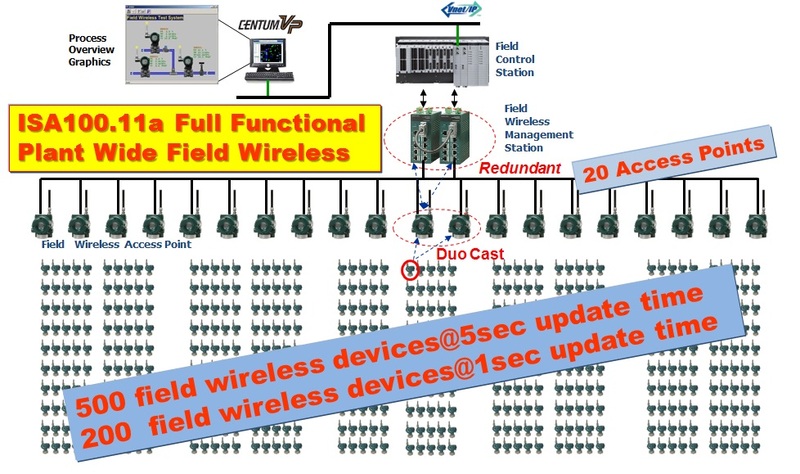 Now, Yokogawa has released a new, large-scale, reliable, next-generation plant-wide field wireless system. In developing this system, which forms the core of field digital solutions, Yokogawa has focused on the following three key features. This new system has been developed in line with Yokogawa’s “Grow” concept of helping customers to grow and enabling ourselves to evolve and continue to offer timely solutions. Although most field wireless systems are currently installed in relatively small areas, demands are rising for increasing the number of monitoring points, covering wider areas, and expanding to process control as well as diagnosis, monitoring, and measurement. To respond to these demands, Yokogawa has developed a large-scale, reliable, next-generation plant-wide field wireless system, which will manage up to 500* wireless field devices. *The number of Wireless Field devices which can be handled depends on software version of YFGW410. 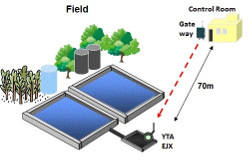 Conventional small field wireless systems are mainly installed as additional monitoring tools in areas with a clear line-of-sight such as tank yards and wastewater treatment facilities. Such systems offer only limited advantages such as improved inventory management, reduced regular visual checking, automated environmental measurement, and reduced wiring costs. In contrast, plant-wide field wireless systems can cover both a large number of measuring points in a small area packed with production equipment where wireless devices are difficult to install, as well as the entire plant. This allows customers to set up wireless devices anywhere in their plants and manage data from those devices to improve plant-wide production efficiency. Our YFGW710, the existing all-in-one type field wireless integrated gateway, combines all the functions of access points and wireless management, enabling small wireless systems to be easily installed. In the new architecture, the YFGW510 serves as an access point and forms the wireless backbone network with the YFGW410 field wireless management station. Therefore, by installing multiple YFGW510 field wireless access points throughout the plant, wireless sub-networks can be built and then connected to each other to create a large-scale, plant-wide field wireless system. The YFGW510 and YFGW410 can communicate via Ethernet, optical Ethernet, wireless LAN, instrumentation cable communication*, and so forth, allowing flexible installation in plants. *Instrumentation cable communication will be supported in the next phase. An example of the system configuration is shown below. 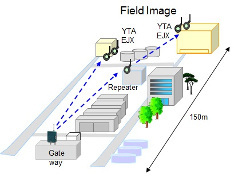 YOKOGAWA Field Wireless has excellent receiving efficiency and the feature is high reliability of wireless physical layers（Reliable Radio).The technology enabled the 600m long distance communication with standard antenna if there is no obstacle. The low packet error rate is realized under the environment of multi path in “Pipe Jungle”. The reliability of network layer is enhanced with the import of new technology. YOKOGAWA proposals are next two technologies. 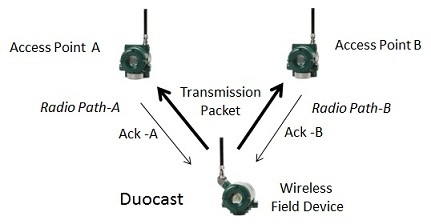 Duocast is a redundancy technology for the wireless path specified in the ISA100.11a standard. In the conventional mesh-topology network, if communication is not established in a path, data is then sent via another path. However, this may affect real-time performance because the data is not sent in the same time slot, but in a later time slot even in the same superframe. On the other hand, Duocast simultaneously sends two identical data in the same time slot, and provided either data is successfully transmitted, real-time performance is maintained. Therefore, Duocast is ideal for ensuring the redundancy of mission-critical wireless paths and helps improve reliability while securing low latency (see the figure below). Duocast can overcome failures of either access point as well as errors in a wireless path. The network between the YFGW510 and YFGW410 is called a wireless backbone network. Its redundancy is specified by the ISA100.11a standard to improve the reliability of the network and is achieved by the redundant YFGW410 stations. Either of the dual YFGW410 stations can deal with disconnections and errors of the wireless backbone network, and malfunctions of the other YFGW410 (see the figure below). stations, one set to Active and the other to Standby, are connected with each other via a synchronous communication cable. If any trouble in the Active YFGW410 is detected, the functions and data are quickly shifted to the Standby YFGW410 to seamlessly continue communication. Wireless Differential Pressure/Pressure Transmitter and Wireless Temperature Transmitter have enhanced with the release of Plant Wide Field Wireless System. The detachable antenna type model has released. The antenna extension cable and high-gain antenna* can used with this model. The placement of antenna can be adjusted with the antenna extension cable without change the installation of transmitters. And the expansion of communication distance becomes possible with high-gain antenna*. *Subject to the Radio law regulation of each country. The battery life of the detachable antenna type model becomes longer than conventional product with low power consumption. It depends on the condition, from 1.5 times to 2 times of battery life is realized. The examples of the battery life is shown below. 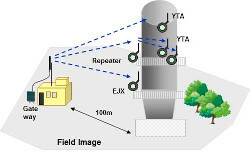 Yokogawa has been researching and developing industrial wireless technologies for ten years and has compared a variety of standards, with the following conclusion: in adopting wireless systems in the fields of industrial measurement and control, wireless physical layers must eliminate instability as far as possible (Reliable Radio) and the system must reinforce it. Among various industrial wireless communication standards, the ISA100 standards were the most suitable for achieving Yokogawa’s policy. Therefore, Yokogawa adopted this standard and released the world’s first ISA100-compliant products in the market in 2010. Yokogawa has since released various wireless applications while its development engineers have visited over 100 sites worldwide for survey. The accumulation of such experience as well as the information obtained from many customers have been reflected in the development to make full use of the advantages of the ISA100 standards (ISA100 Full Functional), and to make the role of wireless communication clearer and securer toward Field Digital Innovation. The general perception that wireless communication is easily disconnected seems to be attributed to our daily experience with mobile phones and wireless LANs. The rapid progress of mobile phone technology meant that the latest digital wireless communication technology could be used to solve the very tough challenge of ensuring that high-speed data transmission rates and reliability are maintained while users are walking or moving at high speed in cars and trains. However, the facts that a user moves at a certain speed and that the location of use is not fixed impose difficult conditions on wireless communication for which the radio wave environment changes dynamically, resulting in the instability typical of wireless communication. Meanwhile, in many industrial measurement applications, the measurement location is considered and then fixed at the point of installation, and even if the user moves, the movement speed is very moderate and the movement range is also limited, and the required data transfer rate is also relatively low, so the environment is such that reliability can be easily maintained for wireless communication. In other words, it is possible to set conditions to ensure sufficient stability for wireless communication beforehand. By introducing the latest digital wireless technology in such a relatively privileged environment, reliability comparable with wired communication can be ensured. 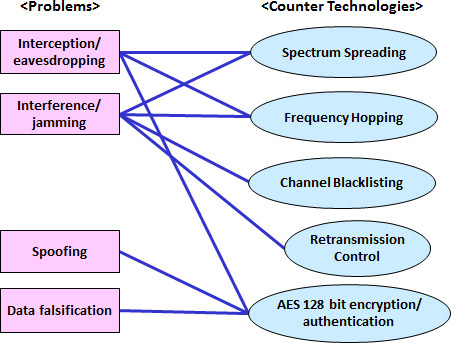 Even for fixed wireless communication, there are some concerns, such as interference and cross-talk from other wireless communication and jamming using the same frequency for malicious purposes. Furthermore, wireless communication signals travel through the air and reach the surrounding areas, so there are concerns such as interception and eavesdropping by a third party, or penetration into the wireless network from the outside. One answer to these concerns is the evolution from analog to digital technology for wireless communication. Wireless communication in the analog era was vulnerable in terms of security as it could be intercepted by anyone using a receiver with the same frequency, and intentional interruption and interference were easy. However, the introduction of digital technology to wireless communication reduced these concerns significantly. The following provides an overview of digital technology. There are some misunderstandings regarding the concerns about the environmental impact of wireless communication. For example, it is not true that field wireless communication is vulnerable to strong magnetic fields, or communication is interrupted by rainfall. In some cases, wireless communication is more advantageous than wired communication. 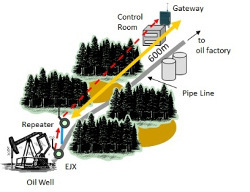 The following summarizes the relations between the environmental conditions and wireless communication. Lightning surge is a phenomenon that a surge current generated by lightning flows through the power supply cable and communication cables and damages the connected electronic devices. Therefore, the lightning surge risk for wireless transmitters is rather small because they are not connected by cables. However, an on-site lightning protection measure is required to prevent a direct lightning strike. The frequency of electromagnetic waves generated by an electric discharge produced by lightning is said to have a wide range between a couple of hertz and 1 gigahertz. However, the higher the frequency, the lower the power becomes, and the problem only occurs when electric discharge and intermittent communication happen to occur at the same time. Even if that happens, the problem can be covered by retransmission control. The 2.4 GHz range used for field wireless communication suffers little impact from rain and snow. This has been proven by experiments.Generally it is said that communication begins to be impacted from 10 GHz and higher. Wireless communication is free from the cable disconnection problem typical of wired communication, which occurs when a cable is broken as a result of a disaster or deterioration in a bad environment, when a cable is damaged by wild animals, or when a cable is cut intentionally by a malicious person. A magnetic field that causes a problem is generally not one in the high frequency range of wireless communication but one in the low frequency range. Wireless communication is advantageous in this respect as an induction current generated by a magnetic field is produced with regards to the conductor (wire). Efficient battery replacement made possible by our unique battery pack technology. 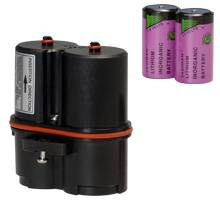 The uniquely designed battery housing compartment and battery pack within our wireless transmitters allows it to be exchanged in the field, even within a hazardous area. The battery pack further enables convenient access to the internal batteries so that they may be replaced as is necessary and restocked. Thus minimizing both waste and cost, while making the battery replacement process as efficient as possible. The batteries used within the battery pack are standard ‘D’ cell Lithium/Thionyl Chloride batteries. These have excellent power versus temperature characteristics along with a long in service life that makes them suitable for use within environments. A combination of two unique technologies has enabled true end to end, through the air digital sensing. Marrying the renowned benefits of the DPharp digital sensing with ISA100.11a, the new industrial standard for wireless sensor network, has brought a truly unique proposition. Advanced high precision digital sensing with all the benefits of wireless deployment; reduced engineering and commissioning with the flexibility to expand the wireless sensor network to meet future demand. The bringing together of DPharp with ISA100.11a represent Yokogawa’s commitment to continue delivering unsurpassed leading edge solutions to the industrial automation industry. Reliable, secure, flexible and intuitive the new wireless transmitter series simplify all aspects of wireless deployment, management and operation while delivering excellence as standard. Whether installed upstream on remote pipelines and wellheads or downstream in tank farms, vacuum columns or loading piers our wireless transmitters will continue to deliver secure, precise, reliable, high integrity process measurements that meet your demand. Our wireless transmitters will increase your process visibility by reducing operational blind spots, which in turn will reduce your process variability, increased yield, and improved product reproducibility while reducing costs and increasing flexibility. ISA100 brings you real sustainable lifecycle benefits to meet your requirements now and in the future. Wireless technology such as mobile phones and wireless networks has become an indispensable part of our lives. Now there is greater demand for compatibility with instrumentation of that wireless technology. So, what is the best wireless technology to use? Most use proprietary communication protocols thus limiting potential applications. It has not been possible for one set of wireless instrumentation to handle multiple brands of products. Engineers were unable to ignore concerns about communication channel security and reliability. But now, Yokogawa has adopted the ISA100.11a wireless communication standard that is geared toward Industrial Automation, and worked to make user-friendly wireless devices that meet international standards. These are based on user requests for industrial wireless sensor networks; the ISA100.11a industrial wireless standard meets all of these requests at once. By adopting industrial wireless technology based on the ISA100.11A standard, we will be able to build highly-reliable, promising new styles of instrumentation that we are confident to solve many problems. 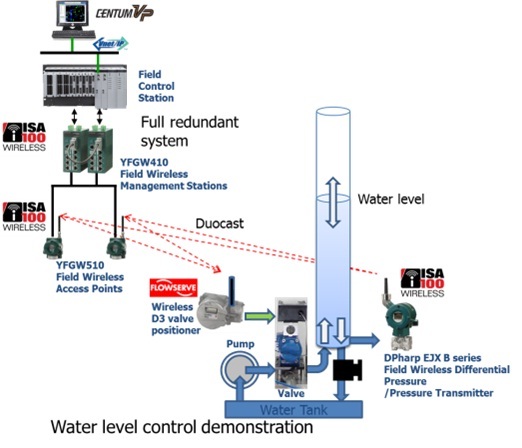 The system designed for this demonstration was comprised of a prototype wireless D3 valve positioner from Flowserve Corporation and Yokogawa’s flagship integrated production control system “CENTUM® VP”, wireless gateway devices, and the DPharp EJX B series wireless differential pressure/pressure transmitter. The field wireless devices were all compliant with the ISA100 WirelessTM by ISA100 Wireless Compliance Institute and featured a fast 1-second data update time. Redundant wireless communications paths were employed to ensure high reliability. Purpose: Yokogawa assures the appropriate wireless control is updated every 1 second. Method: A distribute controller communicates with a wireless valve positioner and a wireless differential pressure/pressure transmitter and controls water level as target four levels. Constitution: "CENTUM VP" distributed control system communicates with the infrastructure of ISA100.11a wireless system and controls the water level by PID control. 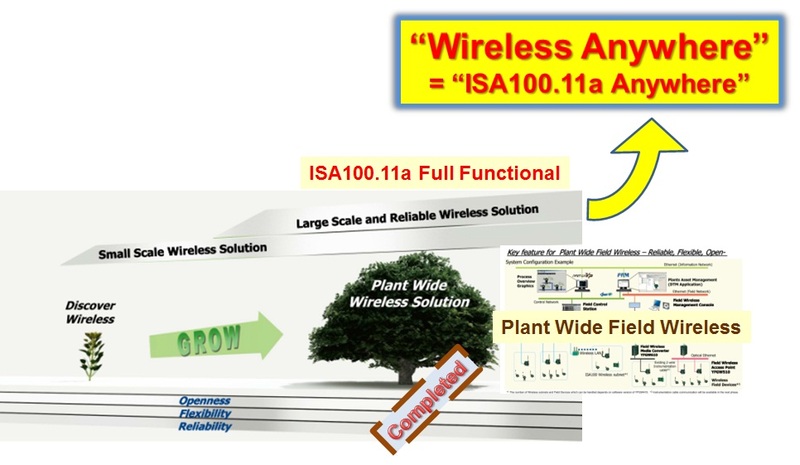 ISA100 Wireless Technology has paved the way to smoothly integrating the plant wireless monitoring and control applications under single wireless infrastructure. Yokogawa is working on the application of wireless technologies that can be suitable for both monitoring and control purposes throughout plants. 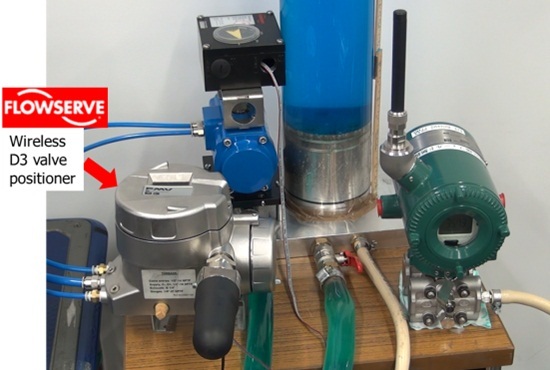 The demonstration conducted by Yokogawa showed for the first time how CENTUM VP could be used under actual plant conditions in a wireless control application. 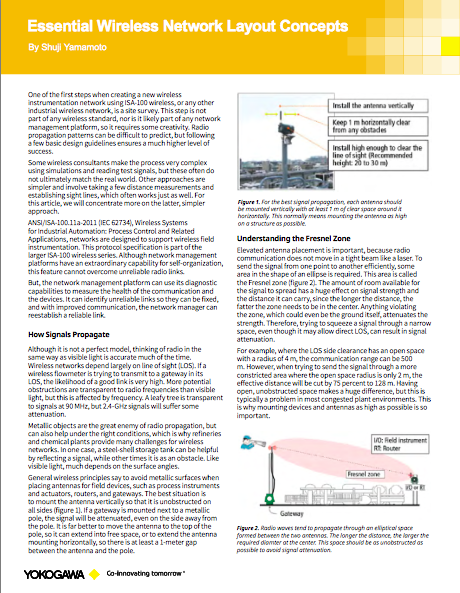 Tired of adding extra repeaters and devices to your wireless sensor network to get proper coverage? Switch to Yokogawa's ISA100.11a wireless system and save money by using less hardware to cover larger areas. Yokogawa's access points and wireless transmitters can reliably transmit 3.4km between devices using our remote antenna option. This means that in a standard 4hops network, your Yokogawa wireless system can cover a 13.6km radius area! Reliable wireless solution is always one of the top concerns for industrial users. 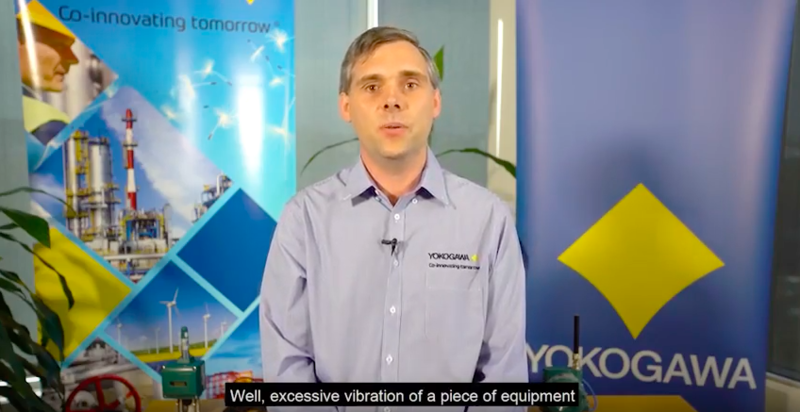 This video demonstrates Yokogawa newly released wireless system solution. It combines the best of ISA100.11a wireless technology with Yokogawa system design expertise. 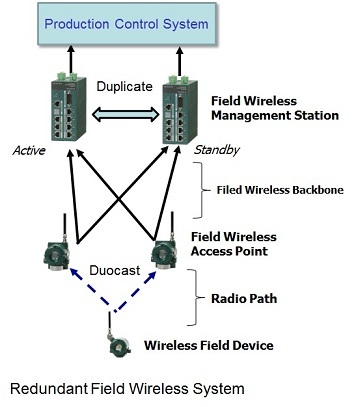 The Yokogawa new wireless system further enhanced the “Reliable Radio” in field device, deployed Duocast communication method in Access Point (YFGW510), and enabled two redundant management station (YFGW410) that able to work simultaneously to achieve overall wireless system reliability. Because of this unique design, one single Yokogawa wireless system can be very flexible for your need to support as much as 500 field devices reliably. Enjoy this demonstration. Yokogawa Wireless brings "Reliable Radio Evolution"
Yokogawa Wireless Solution has a very reliable radio-link feature based on a world-class receiver sensitivity. We found this feature brings dramatically new benefits to customers. 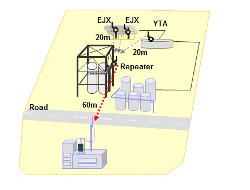 Yokogawa's engineers tested "Long Range Communication" feature of Yokogawa Wireless Solution. 600 m communication with very low Packet Error Rate (PER) is shown in this video. We named this dramatic change "Reliable Radio Evolution" and would like to propagate this concept for customers' benefits. This video is a conceptual video of "Reliable Radio Evolution". 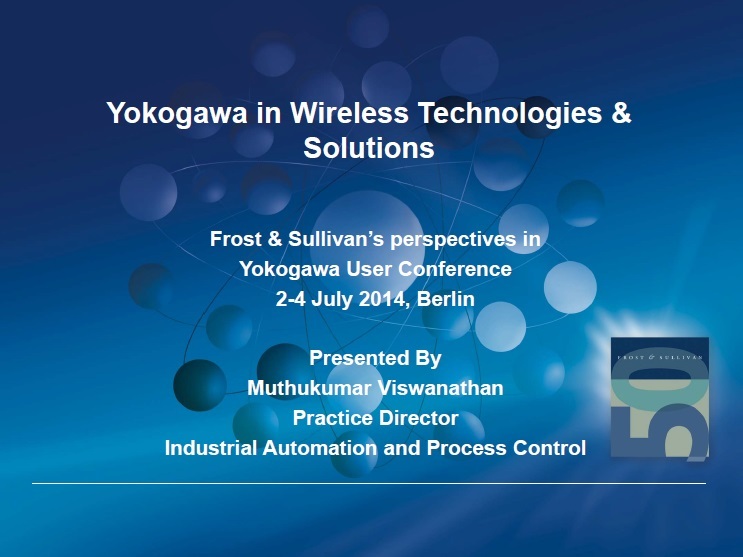 Yokogawa Electric Corporation announces that it has received the Frost & Sullivan 2014 Global Enabling Technology Leadership Award in the wireless solutions category. The Enabling Technology Leadership Award is presented to companies around the world that are best-in-class in a specific category. Field wireless systems enable a plant’s field devices and host-level monitoring and control systems to communicate wirelessly with each other. This has numerous advantages such as allowing the placement of field instruments or analytical sensors in difficult to wire location, which eliminates the need for cables to connect devices, and reduces installation costs. Yokogawa released the world’s first ISA100.11a compliant wireless system devices and wireless pressure and temperature transmitters in July 2010, and the company continues to enhance its lineup of wireless solutions. 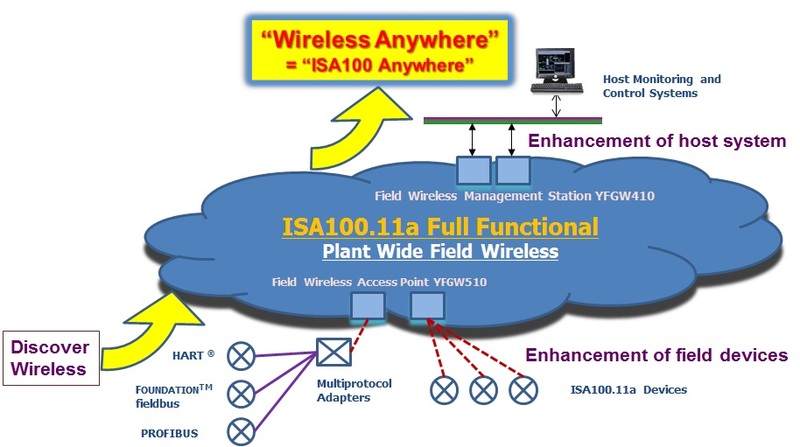 In accordance with the Wireless Anywhere concept, which was announced in April 2013, Yokogawa is seeking to promote the plant-wide use of field wireless systems by developing new ISA100 Wireless™ devices. In December 2013, the company started providing a wireless communications module with a built-in antenna that can help field device manufacturers significantly shorten the time needed for developing wireless solutions. Later this year, the company also plans to release a multi-protocol wireless adaptor that will enable wired field instruments or analytical sensors to be used as ISA100 Wireless devices. Frost & Sullivan selected Yokogawa for this award because of the company's efforts to develop ISA100 Wireless solutions that enable high-reliability, openness, and interoperability. In selecting the award recipient, Frost & Sullivan evaluated companies based on whether they enabled the creation of new products, enhanced current products, enabled new applications, had potential for market acceptance, and had a breadth of access to technology. Yokogawa was recognized for making a superior contribution in developing innovative field wireless solutions. In line with the Wireless Anywhere concept, Yokogawa will continue to expand its lineup of ISA100 Wireless solutions and promote the use of field wireless technologies. The company is working on the application of wireless technologies that can be suitable for both monitoring and control purposes throughout plants. 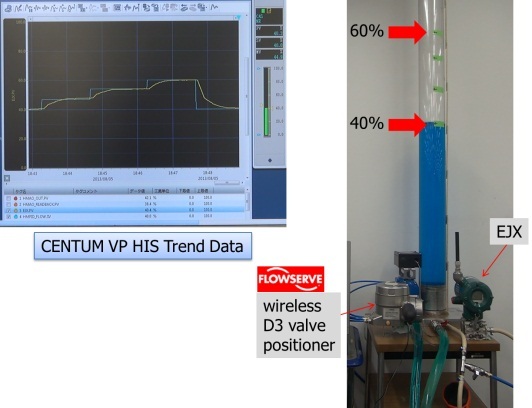 The client wanted to monitor the pressure of the gas well at offshore platform remotely to reduce maintenance cost and increase safety of maintenance personnel. Remote leak detection for pipe line was needed to meet new environmental statute. However cabling earthwork is strictly restricted to protect land environment. The client wanted to monitor the injection gas pressure of gas lift remotely in central control room. Antitheft measures are needed to install new equipments and cables. In the event of a gas line shut down, gas supply must be maintained for a period of time with the use of LNG stored in road tankers. Each tanker must have its pressure monitored to prevent an over pressure situation arising. Delayed Coker is a type of coker who's process consists of heating residual oil feed to its thermal cracking temperature in a furnace. The most important variable in industrial furnace control is temperature. Temperature is measured throughout the furnace in different zones and temperature effects the materials being manufactured and therefore must be precisely monitored to prevent deviations in quality of the final product. The client wanted to monitor the temperature on a chimney. Exhaust air is exposed to the heat on the way traveling from the inlet to the outlet in the chimney. Then constituent of the air transform to harmless elements. It is important to keep the temperature in the chimney as designed. A battery room is used to storage batteries for emergency power management in the plant. Each substation has battery room and the storage batteries are lead-acid batteries which must be maintained within specified operating temperature limits. Temperature management is important to ensure a long service life of the batteries especially for the plant in desert climates. Geothermal power plants create electricity from geothermal energy. These power plants are similar to other steam turbine station; however their heat source is that of the earth's core. The created steam is used to turn the turbine for the production of electricity. Technologies include Dry steam, Flash steam and Binary cycle power stations with Binary cycle being the most common geothermal plant in current production. In the process of geothermal power generation the facility needs to monitor various processes, as in this case steam line pressure sits in remote from control room's location. 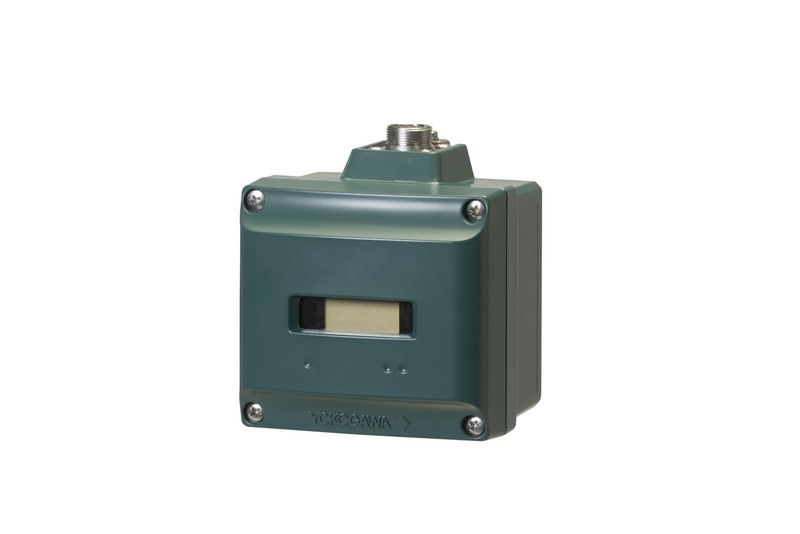 Employ the ISA100.11a-compliant YTMX580 Multipoint Wireless Transmitter. The YTMX580 has 8 channels of universal input, which is perfect for multipoint measurement applications, and it can withstand harsh operating temperatures of -40 to 85 °C. A horizontal rotary miller used to grind the limestone rocks with metallic balls as grinding stones. This is used as the raw ingredient to produce cement powder. The temperature needs to be monitored in order to control the process and the quality of the final product. The user was using an induction temperature measurement based on a rail system that was very fragile and therefore unreliable. Manual temperature reading requires walking about 130 m and climbing up and down elevated sections of the dryer stages. Multiple temperature measurement points along the various stages of the dryer require many cables to the control room. Wireless pressure and temperature monitoring. Repeater was set under the gateway. 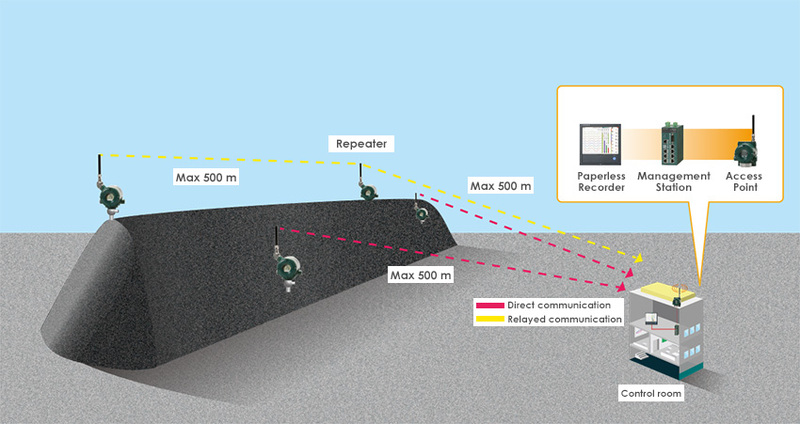 The maximum distance between the repeater and transmitters is approximately 500m. Ground water well level monitoring is needed. Blending plays a key role in industries such as food, healthcare and chemicals etc. Temperature and vacuum measurements are very important in minimizing the moisture content to ensure the quality of the final product. Strictly maintaining them throughout the process ensures the final product yield. Direct Reduction Iron (DRI) is one of the processes to reduce oxygen from iron oxide pellets for steel plant. More than 90% of DRI processes use heated LNG as process gas where PID control for temperature or interlock control is of vital importance. Customer needed efficiency improvement of steel manufacturing by temperature monitoring for heat/cooling equipment. Previous system required periodic compensation lead changing. An induction furnace melts metal by creating very large currents in the material. These currents are induced using three electrodes positioned inside the furnace. The furnace is automated so that once the material has been melted, the electrodes are removed and the furnace then tips the molten metal into a crucible where it can be easily transferred to the production line where it will be cast into ingots. The atmosphere is extremely aggressive and the wired infrastructure is both expensive and very unreliable to maintain. The furnace control requires a total of 20 measurement points distributed around and inside the furnace. The harmonic field effects caused by short circuit 40,000 A (300V). The causes significant interference. repeater x1: between gateway and YTA. With repeater at center: The packet error rate was 0%. Caustic soda and hydrochloric acid, produced in electrolyzer plants, are fundamental materials used in varieties of industries; chemicals, pharmaceuticals, petrol-chemicals, pulp and papers, etc. Profit is the result of the effective production with minimized running / maintenance cost. Proper control of the process brings you stabilized quality of products with the vast operational profit. One important risk to manage with regard to coal stacks is preventing fires due to spontaneous combustion. The use of wireless technology in industrial automation systems offers a number of potential benefits, from the obvious cost reduction brought about by the elimination of wiring to the availability of better plant information, improved productivity and better asset management. However, its practical implementation faces a number of challenges: not least the present lack of a universally agreed standard. This article looks at some of these challenges and presents the approach being taken by Yokogawa. Standards provide many benefits to the automation end user. Standards promote choice, interoperability, transparency and ensure that things work as they should (at least insofar as the standard is defined). The influx of wireless technology into the world of process automation has brought forth its own standard—ISA100—a major standards initiative managed by the International Society of Automation (ISA). When distributed control systems (DCS) first appeared on the industrial automation scene in the mid-1970s, the focus was on control and operator interface. While control and human machine interface (HMI) are still important, today's DCSs have evolved to place increased emphasis on integrating plant-wide asset and operational information to enable operational excellence. Yokogawa Corporation of America (YCA) has accept the recognition from CIOReview magazine on behalf of Yokogawa Wireless Solution as “20 Most Promising Wireless Technology Solution Providers 2015”. Wireless trends: Choosing a wireless network requires evaluation of communication protocols, device availability, and present future user needs.